One of the worst-kept secrets in the motorcycling world is that Triumph will soon be releasing a massively reworked Bonneville. But it looks like there are some real surprises to come as a result. 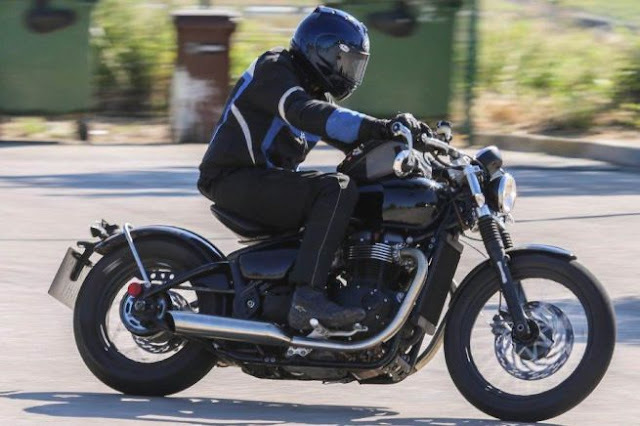 Earlier this week, a bobber carrying the new Bonneville engine was spotted making a few test runs in Spain. The Bonneville is, of course, one of the favorite platforms for custom builders. It's been used for every style of bike imaginable, with the bobber look being a popular choice. Currently Triumph uses its Bonneville platform in five production models: Bonneville, Scrambler, Thruxton, Speedmaster and America. It's anticipated that these models will be kept and updated accordingly when the new liquid-cooled Bonnie is released, probably later this year. There is strong speculation that its parallel twin engine will be increased to 1,100 cc and its power output boosted to as much as 100 hp. Many expect all to be revealed at the EICMA show in late November. If the bike shown above is released it will be unique amongst production motorcycles in the sense that it is a true bobber. Victory Motorcycles has described its Gunner model as a bobber but many purists have been quick to criticise. Here, despite running on a modern, liquid-cooled engine, the solo seat and swingarm contribute to an authentic hard-tail bobber look.